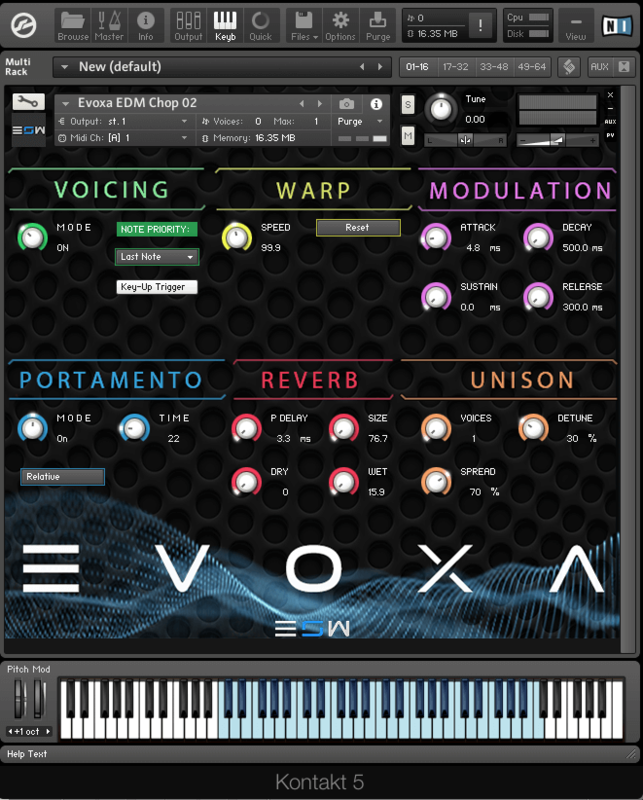 Echo Sound Works is excited to bring you a brand new KONTAKT instrument called EVOXA. It’s a multi-genre vocal chops engine for producers and DJ’s. EVOXA comes loaded with almost 1 gigabyte of samples making up 200 KONTAKT presets. Check out the video walkthrough to get a better idea of just what EVOXA is and what it’s truly capable of. We designed EVOXA for music producers looking for easily playable, fine tuned, inspiring vocal chops perfect for multiple genres of music including Future Bass, Trap, Deep House, Hip Hop, RnB, Chillout, Future House, Melbourne Bounce, Tropical House and so much more. This library is truly one of a kind and its a lot of fun to play with. The KONTAKT instruments come with an easy to use custom interface that gives you all the control you need to seamlessly integrate any of the vocal chops into your productions. REVERB We’ve included a reverb section to add depth to the vocal chops. The video below will show you the presets used in real time. EVOXA is a modern vocal chops engine for NI KONTAKT. It comes loaded with 200 patches and near limitless possibilities Geared for genres like EDM, Future Bass, Hip Hop, RnB and so much more!